Two men who arrived in Phuket by golf cart on Wednesday (April 8) did so with a new Guinness World Record to their names. Mark Cameron (left) and Graham Haslam get the chance to sit in a more comfortable seat. 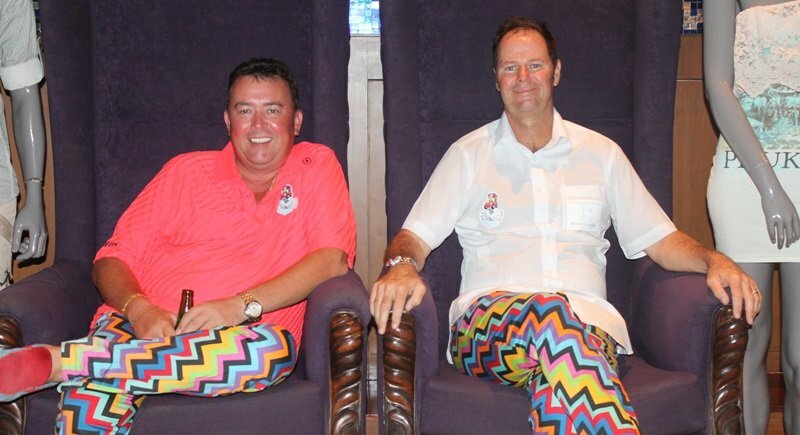 Phuket expats Graham Haslam and Mark Cameron set a new Guinness World Record for "The Longest Drive in a Golf-Cart̕" after travelling about 1,400km from Hard Rock Cafe in Pattaya to Hard Rock Cafe in Phuket. The journey took them one month and one day, and was to raise funds for the local children's education charity, the Phuket Has Been Good To Us Foundation (PHBGTUF). Graham explained, “We were driving to Bangkok one day and he [Mark] said that he was going to do the longest drive on a golf cart. “I said, ʻwhat if we talk to Hard Rock Cafe about driving from Hard Rock Cafe in Pattaya to Hard Rock Cafe in Phuket̕. “After 25 emails, 16 meetings, and a lot of my time, I got Hard Rock Cafe to agree,” Graham explained. “I work full-time raising funds for the Phuket Has Been Good To Us Foundation. The Director of the foundation is my wife, so she̕s my boss. Mark added that this year is the 7th year of the golf tournament. In the previous six years the touramant has raised $2-300,000 for children's charities in Phuket and also the Yim Kids Foundation in Bangkok. “My most memorable moments – not moment, but moments – were the hospitality of the Thai people. “When we needed to stop and charge our cart they were fantastic... they were so hospitable... and as they say in Thailand, you smile... and the smile will get you a lot more than being a grumpy old driver like me. "And thankfully, Graham managed to – well Graham and my wife and the rest of the support team, like Tina and the guys in back office – they managed to get everyone on board whenever we stopped somewhere. Meanwhile, Graham shared his most memorable part of the long journey. He said, “The most impressive moment in my view was when we [accidentally] set the cart on fire and burnt a set of batteries. “Mark and I were both emotional, but the minute we realised the mistake we had made, we immediately changed into repair mode. “How do we fix this problem? What do we do now? How do we get to the next point? How do we move on? “It got to the point where we were both either angry with ourselves or each other. But we never lost focus on how we get the golf-cart to Phuket. “For me that was the highlight of the trip,” Graham recalled. He added, “It was an amazing experience. I have been blessed to have had a very fortunate life, but this is one of the coolest things I have ever done. “Coming up with the idea, planning it, arranging it, succeeding in it and raising B1.5m for charity. What more could I have asked for? “We always had our eyes set on the final goal, and now we have archived the final goal. And I'll tell you now, no one will ever break our record,” Graham concluded.